Teona Strugar Mitevska’s previous film When the Day Had No Name was a bleak exploration of the cultural tensions in Macedonia, demonstrating how a world built on violence will inevitably breed more violence. It was a bold, if flawed, dissection of macho culture in the Balkans, a theme she develops further in God Exists, Her Name Is Petrunya, a feminist satire that seeks to understand the complexities behind the rampant misogyny in her homeland. The film opens with a shot of Petrunya (Zorica Nusheva) as she stands alone in an abandoned swimming pool. Swimming pools generally signify luxury and glamour, but an empty one, let alone a municipal one such as this, alludes to a world where such dreams have long since evaporated. That’s certainly the case for Petrunya. She’s 32, unemployed and living with her parents in Stip, a small town in Macedonia. Virginie Saint Martin’s artful cinematography gives the town’s depressive, empty suburbs their own kind of desolate beauty, but it doesn’t take long for its ugly underbelly to be revealed. Every 19 January, for the holiday of Epiphany, the men of the town conjugate around a nearby bridge as a local priest throws a wooden cross into the river for them to dive after. It’s an event exclusively reserved for men but, after an unsuccessful job interview Petrunya finds herself jumping into the ice-cold water with them. The person who catches the cross is supposed to receive a year’s worth of good fortune and prosperity, but it’s Petrunya who manages to grab it first. The men are furious that a woman has dared to take part in their sacred ritual, and all hell breaks loose, during which Petrunya escapes with the cross and runs home. The men accuse her of stealing it from them, and insist the police arrest her. The commotion that follows puts Petrunya well and truly in the spotlight, and she’s rarely offscreen, with newcomer Nusheva delivering a remarkably naturalistic and commanding performance, shrewdly conveying her character’s sense of emotional exhaustion and stoic determinism. The film’s second half takes place almost exclusively within the local police station. Despite not having broken any laws, Petrunya is taken in for questioning alongside the priest who, despite not having any jurisdiction, seems to be calling all the shot. There’s almost a siege mentality to these scenes, as it doesn’t take long for a crowd of angry men to form outside the station; some even clamouring for Petrunya to be stoned. 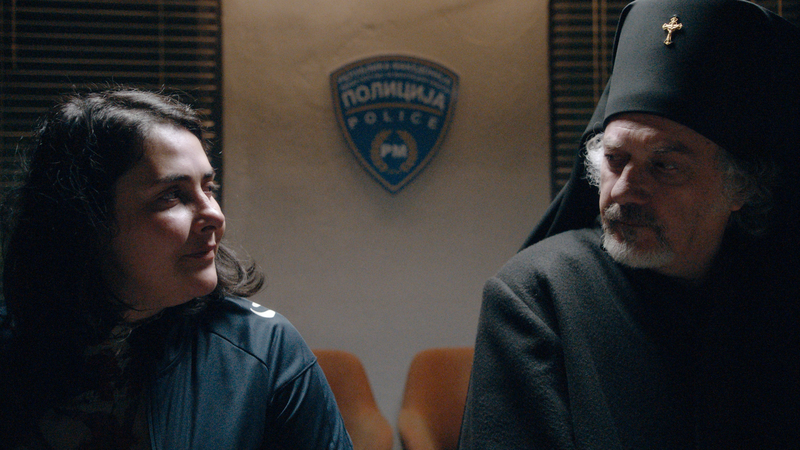 With God Exists, Her Name Is Petrunya, Mitevska has fashioned yet another bleak satire about Hegemonic masculinity in the Balkans. Unfortunately the film’s abrupt ending suggests that she’s still no closer to finding an appropriate prognosis, and as Petrunya squares up to the local priest for their final showdown there’s a sense that although she’s won the battle, the war is long from over.